Very few games resonate in the bones. Fewer still create characters for whom I feel more than a slight affection for, and none of them are found in puzzle platformers. At least, none until Little Nightmares, and the raincoat-clad character, “Six.” Seldom before have I felt a connection with a bunch of pixels put together like the one I feel for the knobby-kneed, bright yellow piece of sunshine in the dark and eerie Maw. 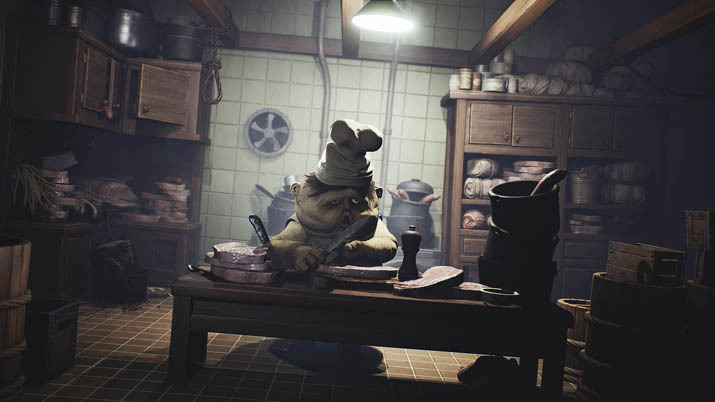 Developed by Tarsier Studios and published by Bandai Namco, Little Nightmares is a perfectly blended horror cocktail made of parts Studio Ghibli (think Spirited Away, and maybe Howl’s Moving Castle – if the castle were evil… and dark…and a boat instead of a castle) and a drop of Coraline / Kubo mixed in an arcane shaker, and poured over the disturbed ice cubes of a Guillermo del Toro creation. It's a puzzle platformer driven by horror and adventure, and a lot of stealth, that takes place in a strange meld of two and three-ish dimensions. It's a symphony of contradictions, a rancid deliciousness that pervades your senses, with an aftertaste that tickles the back of your throat, teasing of a flavor you can’t define, that leaves you desperate for one more taste, even though you can feel the stomachache building. Gameplay isn’t particularly difficult; and the horror isn’t in yo face scary. Its puzzles are cleverly integrated, but its universe is so impactful it allows the player to forget solving puzzles is the core function of the game. Your attention is an emotional one: help this sweet but tough little girl escape the bowels of her nightmare. Its strength, as nightmares dictate, lies in atmosphere. Atmosphere complemented by characters. Powerful are the instances when holding breath in case The Lady saw you, and when sprinting away to escape The Loathsome Janitor. You’ll dread the latter’s fleshy blind face, the snuffling gasps and the long arms. Common sense might become a luxury you choose to forego, opting instead to wallow in panic. Prepare to feel lost, and engaged. Part of what makes the magic happen is simply put, great game design, or the immersive feel its environment brings. You wake up in the twisted world of Little Nightmares as Six, the little raincoat-clad girl, already a prisoner on The Maw. As you progress with her through the 5 Chambers of the Maw (a large vessel of horror), having escaped your cage, you will see things only hinted at. The soundtrack, for starters, is wonderfully encompassing. To sum up the music nicely? My 8-year old said it best: “Mama. This is what scary music is supposed to sound like." Then, is the simple but poignant interaction you’ll have with items. Pick it up, continue holding the button until you choose to put it down. Not yet… Don’t put it down! Ok, there. Put it down! Phew…! Climb the ladder, grasp those rungs tight or risk falling to an undignified death. Fingers are sore. Palms slippery. You get it: the feeling is intense, the great atmosphere help makes that happen, and the feeling of discomfort grows until you reach the point you just want to let the buttons go. Yet doing so would be condemning Six,your little friend, to a positively horrific demise - and you can’t do that. I dare say, I missed the little urchin once I finished the game. Little critters that look like a melding of a garden gnome and a mushroom, a dark room hidden within a maze of pipes that is full of shoes…and something else. Something that wants to kill you…The twin cooks that are more disgusting mounds of flesh than anything living, and squeal like…well, I don’t particularly want to imagine WHAT they squeal like. The room that looks ripped from another time and place, and each nightmare chamber with its very own type of monster. In sum, Little Nightmares has the gift to invade the psyche, and fester in ways you don’t even know will bother you. Another notch on the Creep Factor’s Belt? Proportions are wrong. Six is so fragile. She awakens in a suitcase acting as her bed. Beds are big (and bouncy), chairs are small (and easily moved). The body of a man, hanging from a noose is incredibly gigantic. The stuff nightmares feed upon; skewed reality and darkness, adults warped into creatures by the mind of a troubled child. Oh, Six. What did they do to you? I am often impressed with the websites from particular releases, and the creative ways they try to connect and engage with us. 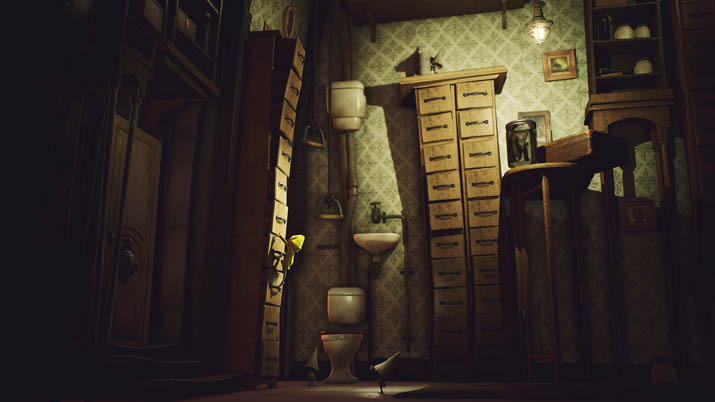 The Little Nightmares site impressed me particularly in this: you won’t just find the title explained, with videos, clips, artwork and a page that details the characters you will meet in the Maw. Oh no. You will also find…. Recipes. For Pastries. FROM THE NASTY, LUMPY CHILD NAPPING CHEFS. Man, oh man. These guys (the Little Nightmares crew, NOT the Chefs) care about their players so much; they have braved the Maw to bring us FOOD?! Food that looks like SIX? Fantastic. I shall ignore the fact that they bear the name…. Crunchy Six (there are also recipes for Eating Leeches, Tasty Nomes, and Bloody Eyes, in case eating Crunchy Six isn’t enough for you). 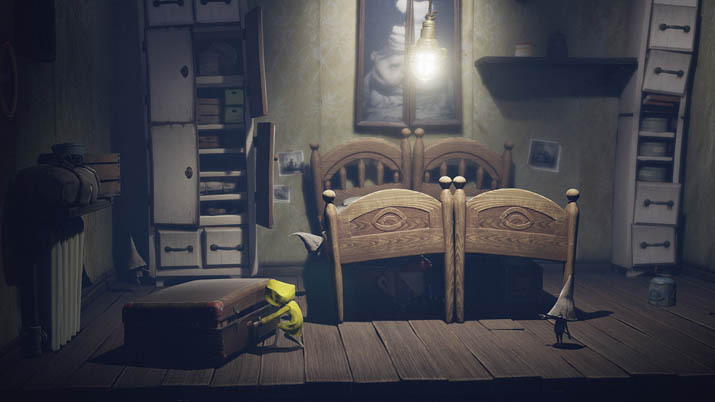 That level of detail, of involvement in other aspects, is just one reason in a very long list, of why I feel so passionate about telling the world: PLAY LITTLE NIGHTMARES. Little Nightmares is short, but it’s complete. Artwork is beautiful, haunting, and horrible is Six’s fate when she gets caught. Don’t let the words “puzzle platformer” draw you away if you aren’t a fan of the genre. This is a memorable title you should not pass, a remarkable cocktail of psychological spirits and immersive gameplay. I know, that were I to face my demons, my own little nightmares, with the courage and tenacity Six shows, I would be stronger for it. To walk through the landscapes of fear and failure, to face and slay the absurd, to emerge into a world of the waking… There’s an example to follow, in Six.